If there’s anything the celeb world has over us, it’s their endless collection of handbags. From Brit royalty to the Hollywood stars, it seems that everyone is lusting after a real leather handbag. But who has been the most influential in the handbag stakes this year? There have been so many iconic handbag designs gracing our magazine pages but who’s had everyone hitting the shops for a bargain copy? This bright yellow beauty has been named the Holy Grail of designer arm candy and whilst Victoria Beckham has been the biggest celeb ambassador, Miss Kardashian has quickly been turning into an avid collector herself. It’s brought back the excitement of colourful leather handbags and this year, colour and brights are set to be huge. The famous Ostrich Hobo is truly welcomed back into the fashion world and it brings back the slouchy leather handbag back into the limelight. The world went crazy for the brown leather bucket bag as soon as the elegant and stunning Olivia Palermo was shot styling hers with a casual black top and mocha coloured skinnies. This look was so iconic that girls all over the world fell back in love with the humble brown leather and everyone went out to copy her. Olivia carries the bucket bag so well and opens the door for oversized handbags to shine and impress in the hype. Every celebrity seems to be shopping for Celine handbags at the moment and Rihanna is one of the latest to join the fashion crowd. Spotted in a simple pair of Converse trainers, a simple summer dress and a loose white cardigan, there’s a really cool rock chick element to her look and this influenced so many girls on the high street to mix leather bags with casual kicks and their Sunday jeans. We may not be able to shop like royalty but we can always turn to the Middleton sisters for style inspiration. Pippa Middleton’s love affair with her handbag was so iconic that the designers re-named the handbag after her. If you love getting celeb inspiration but you don’t have the same celeb shopping budget, check out the amazing real leather handbags from StylishBagShop for some of this year’s must-have handbag styles. 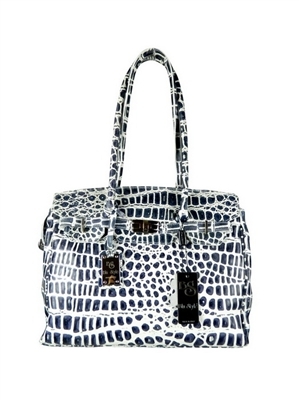 Shop for Leather Handbags UK and grab yourself an iconic bag for 2013!